I’ve discovered one benefit of Social Media. 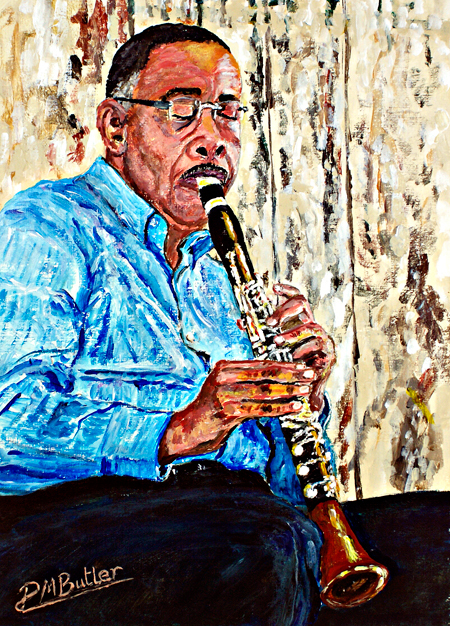 Recently I’ve begun posting my portraits of jazz musicians painted a while again my Facebook Page and Facebook Jazzers Group. Eight years have passed since I met Gregg Stafford and Dr Michael White at the legendary Dew Drop Hall, across Lake Pontchartrain in Mandeville. The occasion was a farewell party for the 2010 Ken Colyer Trust French Quarter Tour Group. Along with Barry Martyn’s band, Michael White and Greg Stafford entranced the audience of ardent fans with their hypnotic performances. 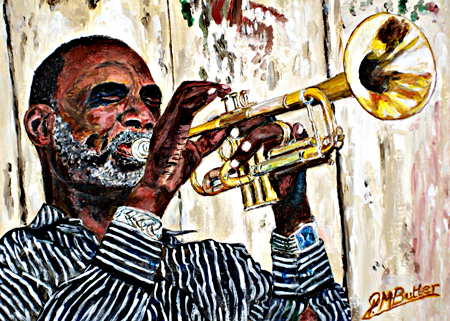 In the shadow of jazz greats like Kid Ory, Bunk Johnson, Buddy Petit and Louis Armstrong, these two deeply committed musicians conjured up echoes of the past and the very best of the spirit and legacy of New Orleans.